The Miami Dolphins, who were coming off an undefeated NFL Championship season in 1972, had an 18-game winning streak on the line (playoff games included) as they met the Oakland Raiders on September 23, 1973. Head Coach Don Shula’s team had last been defeated by the Cowboys in Super Bowl VI following the ’71 season and, in terms of regular season play, had won their last game in 1971 in addition to all 14 in ‘72 and, with a 21-13 victory over the 49ers in Week 1, the first in ’73 for a total of 16. QB Bob Griese directed an efficient ball control offense with FB Larry Csonka the chief ground gainer and WR Paul Warfield the dangerous receiver who could stretch the field and keep opposing defenses honest. The so-called “No Name” defense was tough and effective. Oakland, coached by John Madden, topped the AFC West in 1972 with a 10-3-1 record but had lost its ‘73 opening game at Minnesota the previous week. At age 32, QB Daryle Lamonica had his share of critics but was still a fine passer and there was quality and depth at the receiving and running back positions. The offensive line was excellent and the defense was a good veteran group. The game was played at Memorial Stadium at the Univ. of California due to a scheduling conflict for the Oakland-Alameda County Coliseum with baseball’s Oakland Athletics, and there were 74,121 fans in attendance, which set a franchise record for a Raiders home game. The Dolphins had first possession and moved in typical fashion from their 16 yard line with Larry Csonka and HB Mercury Morris running the ball and Bob Griese completing three short passes. But after reaching the Oakland 45, Csonka fumbled and SS George Atkinson recovered for the Raiders. Now it was Oakland’s turn to move methodically down the field, with an 11-yard carry by HB Charlie Smith followed by FB Marv Hubbard (pictured at left) running the ball four straight times, the last picking up 26 yards to the Miami four. The Dolphins held at that point and George Blanda (pictured at top), who had recently celebrated his 46th birthday and was playing in his 300th pro game, kicked a 12-yard field goal to give the Raiders the early 3-0 lead. The Dolphins had to punt following their next series and, in a possession that stretched into the second quarter, Oakland kept the ball on the ground and moved effectively, the biggest carry being for 19 yards by Smith. Once again the Raiders went for a field goal, this time much longer from 46 yards, but the result was the same as Blanda’s kick was good. Miami went three-and-out on its next possession, but got a break when SS Jake Scott intercepted a pass by Daryle Lamonica. Starting at the Oakland 41, Csonka and HB Jim Kiick ran the ball down to the 18. However, Griese threw three straight incomplete passes at that point and the Dolphins came up empty when Garo Yepremian’s 26-yard field goal attempt was wide to the right. Neither team was able to threaten again for the remainder of the half, which ended with the Raiders ahead by 6-0. The teams exchanged punts to start the third quarter before the Raiders, taking advantage of a short 24-yard kick by Larry Seiple, gained possession at the Miami 46. Smith and Hubbard again ran to good effect and Lamonica completed a pass to Smith for seven yards. The drive stalled at the 12 and Blanda kicked his third field goal, this time from 19 yards. RB Charlie Leigh returned the ensuing kickoff 51 yards to give the Dolphins good starting field position at the Oakland 45, but they were unable to put together a drive and Yepremian was short on a 45-yard field goal attempt that DT Art Thoms, stretching the full length of his 6’5”, got a hand on. The teams again traded punts as the contest headed into the fourth quarter, with neither able to move well on offense. With 11 minutes remaining in the game, the Raiders began to advance as Lamonica completed passes to WR Fred Biletnikoff for nine and 22 yards. From the Miami 27, Smith and Hubbard again ground away at the Dolphin defense, and after driving 58 yards in 12 plays, Blanda was successful on a 10-yard field goal try, his fourth. With the clock down to 2:24, Oakland was up by 12-0. The Dolphins came out throwing following the kickoff, with Griese completing passes to Kiick and Lee that totaled nine yards. Morris ran for six yards and a first down, and after an incompletion, he carried for seven yards. 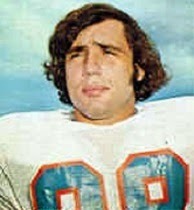 Griese threw to TE Jim Mandich for ten yards and the Dolphins picked up another 15 yards thanks to a personal foul. The seven-play, 75-yard series concluded with Griese passing to Mandich for a 28-yard touchdown. With Yepremian’s extra point, the Dolphins were down by five points and the clock showed just over a minute to go. Miami tried for an onside kick but HB Pete Banaszak recovered for the Raiders. Three running plays were followed by a punt into the end zone and, with 42 seconds left and a winning streak on the line, the Dolphins took over at their 20. But all four of Griese’s passes fell incomplete and the Raiders held on to win by a final score of 12-7. Oakland led in total yards (250 to 195) and first downs (12 to 10), reflecting the defensive nature of the contest. Neither team reached triple figures in net passing yards, with the Dolphins leading by 90 to 63. Miami turned the ball over twice, to one by the Raiders. Daryle Lamonica went to the air just 10 times and had 7 completions for 63 yards with one intercepted. Marv Hubbard ran for 88 yards on 20 carries and Charlie Smith was right behind with 80 yards, also on 20 attempts. Fred Biletnikoff was Oakland’s leading receiver with three catches for 36 yards. The specialists did their part, with George Blanda kicking four field goals in as many attempts to account for all of the team’s points and Ray Guy averaging 49.0 yards on six punts. Otis Sistrunk, Art Thoms, and Phil Villapiano were most noteworthy in what was an outstanding group effort by the Oakland defense. For the Dolphins, Bob Griese completed 12 of 25 passes for 90 yards and a touchdown with none intercepted. Mercury Morris gained 48 yards on 7 carries and Larry Csonka had 47 yards on 10 attempts. Charlie Leigh led the club with three catches, for 16 yards, while Jim Mandich (pictured at right) totaled 38 yards on his two receptions that included the game’s only TD. The Dolphins shook off the loss and reeled off ten straight wins on the way to a 12-2 record and second Super Bowl victory. Oakland lost the following week, and with the offense having difficulty scoring points, Daryle Lamonica was replaced by Ken Stabler at quarterback. The Raiders again topped the AFC West at 9-4-1 and advanced to the AFC Championship game, where the Miami exacted its revenge. 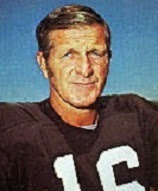 The 24th-year veteran George Blanda went on to kick a career-high 23 field goals in 33 attempts (69.7 %) and, adding in 31 extra points, scored an even 100 points. 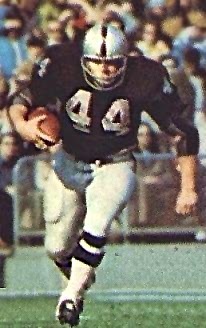 Marv Hubbard led the Raiders in rushing with 903 yards and in touchdowns with six. He was selected to the Pro Bowl.